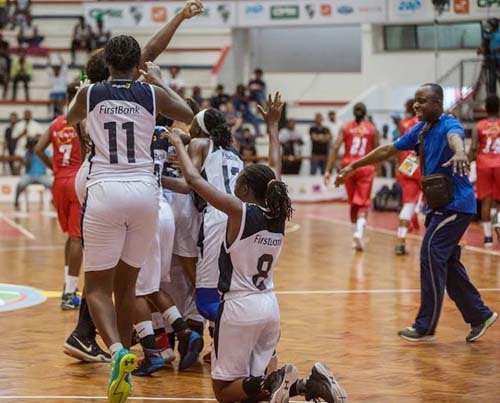 First Bank Basketball Club defeated Vita Club of Congo 93-69 to win the bronze at the FIBA Africa Champions Cup for Women which ended yesterday in Maputo, Mozambique. The Nigerian Champions played better than in their semi final loss to host, Ferroviario and looked solid even when they trailed after the end of the first quarter which ended 21-14. The other quarters ended 9-27, 22-23, 17-29 for a cumulative score of 69-93 in favour of First Bank to finish third. The Nigerians also finished third last year in Angola beating host, Inter Club. Once again, Jasmine Nwajei led the floor with 23 points, skipper Nkechi Akashili added 15 points, Cecilia Okoye and Nkem Akaraiwe had 11 points respectively, while Malaika Nyree Green contributed 10 points. For the Congolese, Ortice Kabobo Haongi led her team in scoring with17 points, Marlene Ngobeleza who lasted the entire game added 16 points, while Gracia Mawano Nguz and Alliance Ndiba contributed 13 and 12 points respectively. The Congolese reduced the deficit to eight points early in the fourth quarter but the Nigerians who were bent on redeeming themselves after their poor performance in the semi final against the host, seize the initiative and went on a scoring run which extinguished the fire in the Congolese. Akashili stated that third place games are very difficult to play and commended her teammates for putting in their best despite the semi final disappointment. She said bringing in the foreign players at the venue of the competition would not help the team urging the bank’s management to help reverse the trend. “We had the chance of winning the championship with the calibre of players in the team but the pros joined us in Maputo and did not understand our play. So it is necessary to bring them in early for the next championship,” Akashili added.